Friedrich (Frederick), Duke of Württemberg, 1593-1608, was born 19 August 1557, the son of Georg I, Count of Württemberg-Mömpelgard (1498-1558), (half brother of Ulrich, Duke of Württemberg) and Barbara of Hesse (1536-1597). He succeeded Ludwig, Duke of Württemberg (1554-1593), (son of Duke Christoph (1515-1568) and grandson of Duke Ulrich) in 1593. Friedrich was a gifted and competent ruler, who, however, was always like a stranger among the Swabians. He freed Württemberg from Austria, and worked toward a union of Protestant rulers even at the risk of conflicts with Catholic rulers. He sought to improve the welfare of his subjects, and settled Lutheran exiles from Styria for whom he founded Freudenstadt. By creed Friedrich was strictly Lutheran, opposed to both Calvinism and Catholicism. However, he lacked moral and religious seriousness. The numerous Anabaptists in his country interested him only in connection with the practice of confiscating their land for the benefit of his coffers. He was in perpetual need of funds. In 1594-95 there was complaint in the Diet concerning the curtailment of the inheritance of the children and other heirs of the Anabaptists because of the confiscation of their property. In 1600 and 1606 Friedrich demanded official reports on the number of Anabaptists immigrating to Moravia. The measures against them became increasingly severe, since his councilor Enzlin persuaded him that the royal coffers were being seriously injured by the previous handling of Anabaptist property and its extremely low selling price. Then the land procurator Esslinger was commissioned to examine the matter and see to the rapid sale of these lands (officially still treated as orphans' property). Payment for the land, which had hitherto been done little by little, was now to be made as soon as possible; this created difficulties in years of poor crops, and threatened to estrange still further the people from the duke and the church. When in 1608 Friedrich died, the complaint concerning the handling of Anabaptist properties ceased altogether, which from now on came under separate management. But when the Austrian government occupied the country (after the Battle of Nördlingen), all these funds from Anabaptist properties were confiscated again. 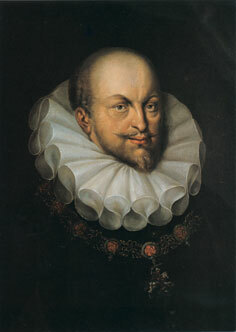 Friedrich died 29 January 1608 and was succeeded by his son Johann Friedrich (1582-1628). Hege, Christian and Christian Neff. Mennonitisches Lexikon, 4 vols. Frankfurt & Weierhof: Hege; Karlsruhe: Schneider, 1913-1967: v. II, 2-3. Sattler, C. F. Geschichte des Herzogtums Württemberg unter d. Regierung d. Herzogen V. Ulm, 1772. Stälin, Paul F. "Das Rechtsverhältnis der religiösen Gemeinschaften und der fremden Religionsverwandten in Württemberg nach seiner geschichtlichen Entwicklung." Württembergische Jahrbücher (1868): 151-312. Bossert, Jr, Gustav and Richard D. Thiessen. "Friedrich, Duke of Württemberg (1557-1608)." Global Anabaptist Mennonite Encyclopedia Online. April 2007. Web. 25 Apr 2019. http://gameo.org/index.php?title=Friedrich,_Duke_of_W%C3%BCrttemberg_(1557-1608)&oldid=145175. Bossert, Jr, Gustav and Richard D. Thiessen. (April 2007). Friedrich, Duke of Württemberg (1557-1608). Global Anabaptist Mennonite Encyclopedia Online. Retrieved 25 April 2019, from http://gameo.org/index.php?title=Friedrich,_Duke_of_W%C3%BCrttemberg_(1557-1608)&oldid=145175. Adapted by permission of Herald Press, Harrisonburg, Virginia, from Mennonite Encyclopedia, Vol. 2, p. 384. All rights reserved.